3 January. The Richmond, Virginia paper reports from North Carolina: "Wilmington, N. C., Jan. 3. --The secession flag, with fifteen stars, was raised here to-day by a large and enthusiastic gathering of people. A secession meeting was held to-night at the theatre, which was densely crowded. The secession feeling is increasing daily." 9 January. After seceding from the Union on Dec. 20, 1860, South Carolina initiates hostilities by firing upon the Star of the West, an unarmed merchant vessel hired by the U. S. government to deliver troops and supplies to Fort Sumter in Charleston Harbor. The order to fire is given by Governor Francis Pickens. The ship retreats. These are the first Confederate shots fired at a vessel flying the U. S. flag. 9 January. Mississippi secedes from the Union. 10 January. Florida secedes from the Union. At Pensacola the Federal garrison spike their guns and move offshore to Fort Pickens on Santa Rosa Island. Pickens will remain in Union hands throughout the war. 11 January. Alabama secedes from the Union. 11 January. Having written to the President to apologize, Governor John Ellis of North Carolina writes to militia commander John L. Cantwell in Wilmington with instructions to return Forts Johnson and Caswell which Cantwell's troops have seized to the U. S. government -- that North Carolina has no authority to take U. S. property. 19 January. Georgia secedes from the Union. 19 January. Governor Ellis sends Charles E. Lee of the Charlotte Military Academy to the north with orders to buy arms and military equipment for North Carolina. The bill totals $242,405. 20 January. At Fort Sumter, commanding officer Major Robert Anderson asks that he be allowed to send the women and children in the fort to New York. His request is granted and 17 women, 12 children under 10 years of age, and 11 infants under 2 years of age leave. 26 January. Louisiana secedes from the Union. 29 January. Kansas enters the Union as a state; their constitution prohibits slavery. 31 January. The North Carolina legislature re-elects Thomas Clingman as U. S. senator. (At this time senators were not elected by popular vote.) Later this year the Senate will expel him for anti-Union activities and he will go on to be a Confederate general. *A Confederate Nurse, by Ada W. Bacot, p. 27. Call #: 973.775 BAC. Call Number: FIC TRO N.C. Opening on New Year's Eve 1861, almost six months before North Carolina's grudging decision to secede from the Union on May 20, 1861, this sprawling account revolves around the bustling seaport of Wilmington, which serves as the lifeline of the Confederacy. Real-life historic figures are artfully integrated with an extensive dramatis personae of flamboyant and idiosyncratic fictional characters including Belle O'Neal, a sensuous rebel spy; Cyrus Bone, a Confederate deserter; and Largo Landau, the daughter of a Wilmington merchant who becomes a patron of the poor. An impressive novel from a distinguished scholar/author, this title will appeal to the countless fans of Cold Mountain as well as to the Civil War buffs who normally stick to nonfiction. In December 1859, the state of New Jersey is perched undecidely between two political camps: one wanting to preserve the Union and the other made up of supporters of the Southern States. When his sons accidentally kill the woman they both love, wealthy entrepreneur Edward Bannon sees an opportunity to keep a foot in both camps. He sends his eldest son, James, to the Virginia Military Institute and the weaker son, Kevin, to the New Jersey Militia. When the Civil War begins, the brothers find themselves fighting on opposite sides. The story follows them from one battle to the next, culminating in the horror of Gettysburg. Best-selling novelist Coyle, best known for his military novels, writes convincingly of combat and of conditions within the two armies. Curiously, though, his prose truly comes alive when he is describing the lives of women caught up in a war in which they were not allowed to participate. In 1860 and 1861, while working in her father's lighthouse on an island off the coast of Delaware, fifteen-year-old Amelia records in her diary how the Civil War is beginning to devastate her divided state. In this account of the secession winter of 1860-61, historian Klein travels from Charleston, South Carolina, to Washington, D.C., and other places where politicians and military men wrestled with saving the Union and building the Confederacy while trying to avert civil war. Brother Against Brother : The War Begins, by William C. Davis and the editors of Time-Life Books, pub. 1983, 176 p., call #: 973.7 DAV. The decade of the 1850s brought the United States exceptional growth and prosperity. The population increased by 35 per cent, to more than 31 million. Railroad trackage more than trebled, reaching 30,000 miles. The production of all kinds of foodstuffs and manufactured goods rose dramatically. But along with this growth came an equal growth in tensions and disagreements between the sections. This beautifully illustrated book takes the reader through these years and up through the final collapse of compromise at Fort Sumter. 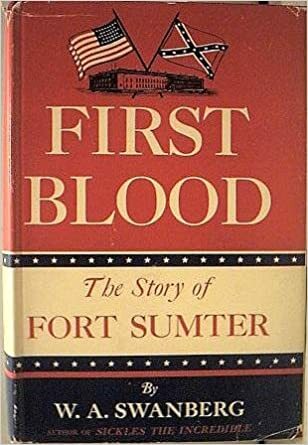 This story of events from 1860 on leading up to and surrounding the attack on Fort Sumter looks at both the Northern and Southern points of view and at the fort as a symbol that extended the attention paid to it well beyond its military importance. However, the problems of Robert Anderson, commander of Fort Sumter and a man with an impossible job, do receive a significant amount of attention. 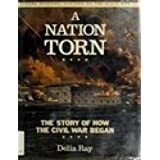 This book discusses the series of events that led to the secession of the Southern states from the Union and to the start of the Civil War. It includes a map of the Mason-Dixon line, a timeline, glossary, and a list of further reading. Ages 9-12.